The Nails sound can still be summed up as “utter chaos” or that “it’s almost entirely forgettable because it is over before it starts” in reference to aforementioned micro-songs playing at breakneck tempos. You Will Never Be One of Us received the customary testosterone injection to ensure that fans can rejoice at the unrepentant ferocity that Nails are known for. Vocalist Todd Jones, who had a throaty shout on their previous two albums, has now adopted a more guttural style that also appears to have been altered in the studio at the same time. Friend to All and Life is a Death Sentence both feature the masterful tempo shifts that see Nails instantly drop the suffocating blast beats to switch to the bridge of the song or a slower guitar riff respectively because despite rushing through songs, they always manage to find time to throw this impressive feat into the mix. There is some change to be found in the title track and Violence is Forever. Both are fairly accessible, at least by Nails standards, with the former having the mantra “you will never be one of us” far more distinguishable from the other lines to give it something resembling a hook (albeit loosely) and the latter focuses on memorable riffs while playing for a reasonable three and a half minutes. Some noise is then thrown in at the end just in case you thought Nails might go easy on your ears. 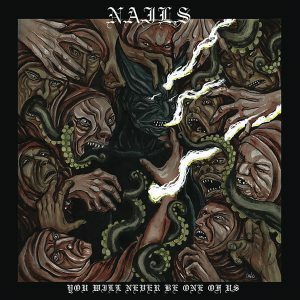 As Nails tradition has it, the final song is longer and more experimental than the rest and They Come Crawling Back does not disappoint. At 8 minutes long it takes up a little over 1/3 of the album and is by far the longest song Nails have recorded by about 3 minutes. It starts out with a slow, desolate black metal guitar riff accompanied by the lo-fi distortion you’d expect from an early 90s album before thundering into life. Starting with lots of momentum, the song slows down and eventually enters into sludge metal territory that is spliced up with some guitar screeching to disorientate the listener and a few of the words are quietly spoken too. 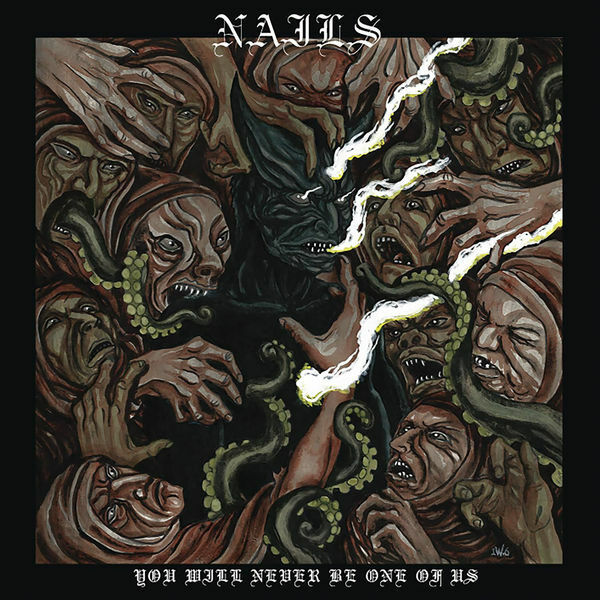 If you are already a fan of Nails then You Will Never Be One of Us will not disappoint. For those wondering where to start with Nails then the longer playing time and improved song writing will make this album an ideal starting point. Nails haven’t changed that much so for the minor differences to add up to something significant it will be over the course of a few albums.